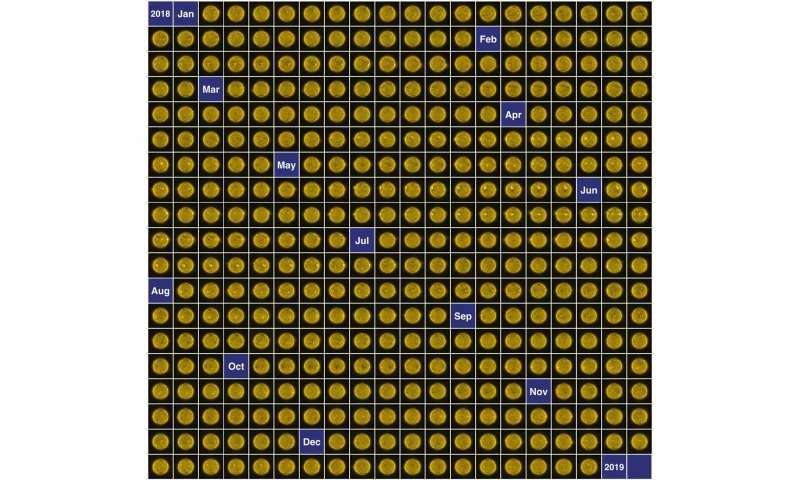 This montage of 365 images shows the changing activity of our sun through the eyes of ESA's Proba-2 satellite during 2018. The images were taken by the satellite's SWAP camera, which works at extreme ultraviolet wavelengths to capture the sun's hot turbulent atmosphere – the corona, at temperatures of about a million degrees. It was classed as a 'C-8.1' in the classification system that divides solar flares according to their strength. The smallest are A, followed by B, C, M and X, with each letter representing a ten-fold increase in energy output such that an X-class flare is 100 times stronger than a C-class flare. But the solar minimum is a useful time for studying the evolution of active regions without the complication of overlapping and interacting regions. Active regions can persist for days to months, and are observed to rotate across the sun's face many times. The sun, and the sun-Earth interaction, is the focus for a number of active ESA and NASA missions, including – in addition to Proba-2 – ESA's Cluster satellite quartet, the ESA-NASA Solar and Heliospheric Observatory (SOHO), NASA's Solar Dynamics Observatory, and more recently, NASA's Parker Probe. Planned for launch next year, ESA's Solar Orbiter will provide close-up views of the sun's polar regions, which is key for better understanding the solar cycle, and will also be able to watch activity building up on the side not visible from Earth.